Schedules re-ordering quantities and dates. Excel spreadsheets organize delivery timetables and stock level forecasting into JIT purchasing schedules. Spreadsheet calculations tell you when to issue purchase order to sustain JIT minimum stock balances. Provides closing weekly inventory balance forecast spreadsheets - for each stock item. Provides weekly purchasing requirement planning spreadsheets for individual stock items. Provides When to re-order dates to maintain minimum stock levels. Provides statistical analysis spreadsheets with embedded Excel statistical functions for JIT inventory management. 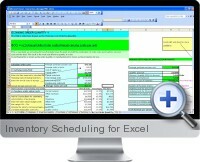 Excel Inventory Database plus built-in Look Up functions. Excel Supplier Database linked to Purchase Order template plus LookUp functions. Capacity for 1,250 inventory items database and 2,500 purchase orders at any one time. Tutorial version containing complete JIT method explanation.